The Caudron C.59 was a French, two-seat biplane with a single engine and a canvas-covered fuselage. The French aircraft manufacturer Caudron made this aircraft between 1922-1924. It was suitable for several purposes. The Caudron C.59 was used in France, Bulgaria, China, Finland, Turkey and in the Spanish Civil War. There was also a C.59/2 version, which was equipped with a 230 hp Lorraine 7Ma engine. More than 1,800 Caudron C.59s were manufactured. The Finnish Air Force purchased three Caudron C.59s from France in 1923. The aircraft first carried the air force designation codes 2E3-2E5 and from 1927 on CA-48 - CA-50. The manufacturing numbers of the aircraft were 5407-5409. The aircraft were equipped with landing gear, but there were at least one aircraft (2E3) was fitted with floats. The aircraft were accepted into service on March 8, 1923 and the last one was taken out of service in 1931. 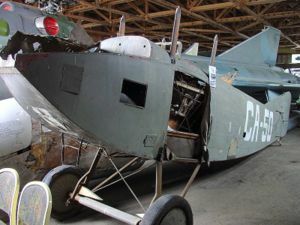 Px�ijx�nne Tavastia Aviation Museum in Asikkala, Finland has one Caudron C.59 in storage. Kalevi Keskinen, Kari Stenman, Klaus Niska: Suomen ilmavoimien lentokoneet 1918-1939, Tietoteos, 1976. Caudron C.59 Pictures and Caudron C.59 for Sale.